Did you know that every month there is one day free admission for the permanent exhibitions? This offer is for visitors under 26, or for two adults accompanying a family member under 18. This is also only valid for citizens of the European Economic Area (EU + Norway + Iceland+ Liechtenstein). This museum houses the largest natural history collections of Hungary and the region. It has many different departments so you will definitely find something that interests you, with interactive demonstrations and educational programmes as well. How to get there: from Katona Apartments take metro 3 from Ferenciek tere to Nagyvárad tér (4 stops). Free on the third Saturday of each month. 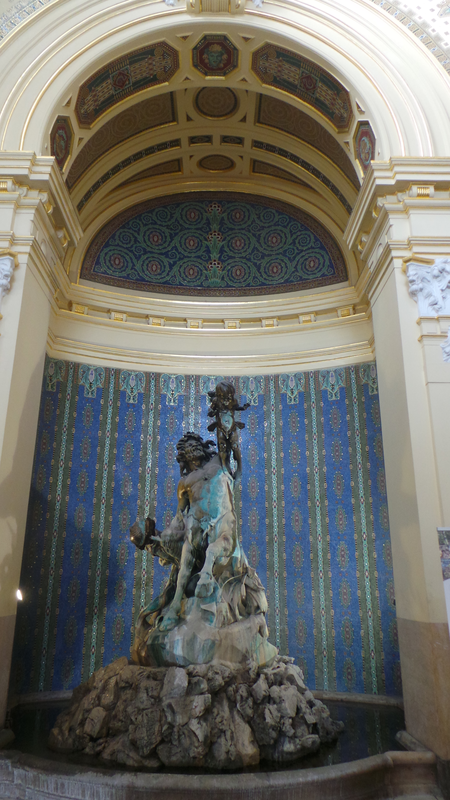 This is the primary museum for international art in Budapest. It mainly consists of international artwork from artists across Europe and is divided into six major collections: Egyptian Art, Classical Antiquities, Sculpture, Old Master Paintings, Department of Art after 1800, and Prints and Drawings. 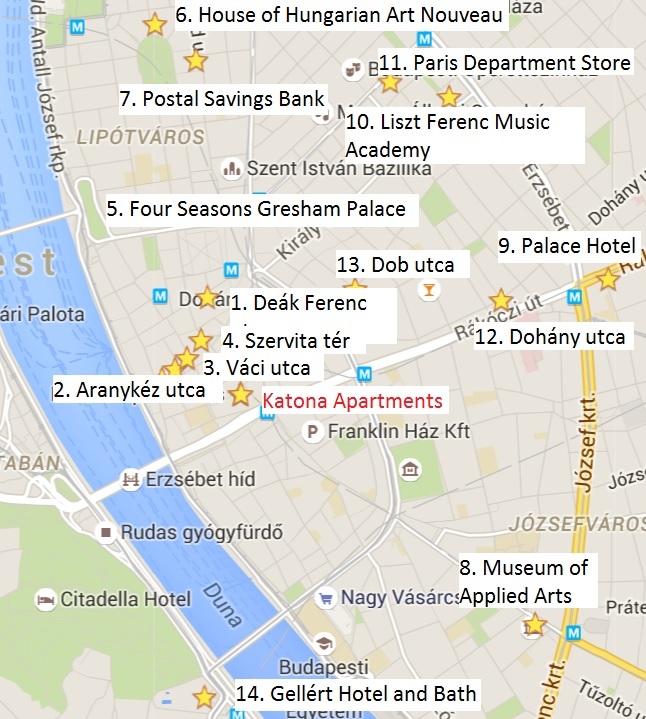 How to get there: from Katona Apartments walk to Vörösmarty tér. Take metro 1 to Hősök tere (Hero’s Square). The Hungarian National Museum has several permanent displays covering Hungary’s prehistory to the fall of the communist system. For instance, you can find out about the Scholar Hungarians who made the twentieth century or, if you prefer something a little older, one room displays the medieval Hungarian Coronation Mantle, a ceremonial robe once worn by Hungarian kings at their coronations. Going back even further, another permanent exhibit focuses on Medieval and Early Modern stone inscriptions and carvings and The Roman Lapidary exhibit is a collection of ancient Roman stone inscriptions and carvings. How to get there: this museum is a 10 minute walk from Katona Apartments. Walk in the direction of Astoria, once there turn right and the National Museum will soon be on your left hand side. The museum is located in Buda Castle and is the largest public collection documenting and presenting fine art in Hungary. Not only do you get to see some fantastic pieces of art but if you make your way to the dome terrace you can also enjoy some great views over the city and the river Danube. How to get there: from Ferenciek tere take bus no. 5 or bus no. 178, get off at Dózsa György tér and walk up the stairs until you reach the foot of the Castle wall to the left. Free on the third Sunday in each month. Szentendre is a charming little town north of Budapest, and there is more than just the Open Air Museum that is worth a visit here. 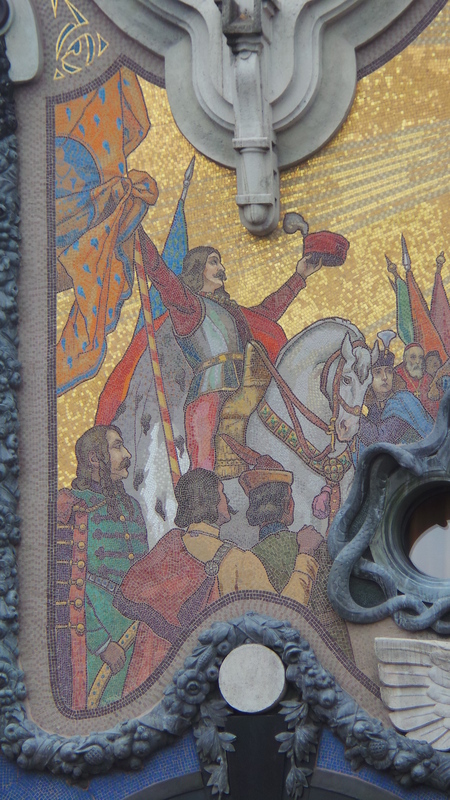 Please take a look at my other post to find out more about Szentendre and what to do there. The Open Air Museum itself is a historic village with many original buildings and objects representing Hungarian architecture and culture from the end of the 18th century to the middle of the 20th century. How to get there: Take metro 2 from Astoria in the direction of Déli Palyaudvar and get off at Batthyány tér. Here, change to the suburban railway line H5 and take a train to Szentendre, the journey takes approximately 39 minutes. From the Szentendre railway station take the local bus from stop no. 7 to Skanzen. Free on the last Saturday in each month. The exhibitions in the Budapest History Museum focus on the unstable history of the 2000 years when the city of Budapest was split into three individual towns, Buda, Pest and Óbuda, and what these town were like. Here you will find the remains of the town Aquincum, a former military garrison of the Roman province of Pannonia, including a large amphitheater for 1,600 spectators. How to get there: Walk to Astoria and from there take bus no.9 in the direction of Óbuda, Bogdáni út. Get off at Flórián tér (14th stop) and change to bus no.134 in the direction of Békásmegyer, Újmegyeri tér. Get off at the 4th stop, Záhony utca. 1037 Budapest, 108, Kiscelli u. The museum presents various objects and documents related to the history of the capital after 1686 whilst the Budapest Municipal Gallery collects and presents works of art from the 20th century and contemporary artists of Budapest. How to get there: Take metro 2 from Astoria metro stop in the direction of Déli Palyaudvar. Get off at Batthyány tér and take tram no. 19 or 41 to Szent Margit Kórház, then walk for about 10 minutes back on Bécsi Street and up the hill on Kiscelli Street. Free on the last Sunday of each month. Here you will find collections from Hungary’s military history including memorabilia and artefacts from the medieval times to the world wars and the present day. How to get there: From Ferenciek tere take bus no. 5 in the direction of Pasaréti tér until Körmöci utca stop (6 stops ). Ludwig Museum collects and displays masterworks of modern and contemporary art. Although it focuses on Eastern and Central European art, it also puts a special emphasis on presenting valuable pieces of American pop art. How to get there: Take tram no. 2 from Március 15. tér in the direction of Közvágó híd. Get off at Müpa – Nemzeti Színház stop (5 stops). Please, no! I beg you not to look for a fast food restaurant in Budapest when you start feeling hungry. … Oh, you want to go to the McDonald’s at Nyugati Train Station? That’s a splendid idea. The contrast will shock you. This fast food restaurant is not what you might expect. Classical bourgeois atmosphere blends with the present day requirements of the franchise. In any case, I recommend you take a look at this interesting mixture of styles. The fast food restaurant is in a side building of the Nyugati Train Station that opens from the big ringroad. (address: Teréz körút 55). Both Nyugati Train Station and the building of the recent McDonald’s were designed and built by Gustave Eiffel’s company (constructed between 1874-77). Gustave Eiffel is the man who went on to design the Eiffel Tower in Paris about 10 years later (constructed in 1889). Although the food and beverage selection is the usual menu and the service is the same as any other McDonald’s restaurant in the world, here you can fly back in time while sipping your coffee and munching on your hamburger. The interior is beautiful and unusual with a staged setting. The service area is split into two levels with a McCafé upstairs, and the normal fastfood restaurant below. The dining area is spacious and elegant with huge windows, decorated walls with reliefs and a high curved ceiling. From spring till autumn the restaurant has a lovely outside area as well, looking out at a green space. It’s one of the busiest fast food units in Hungary and surely one of the nicest ones in the world. Do you have a favourite style of visual arts? Mine is Art Nouveau. This is an art movement that was most popular during the turn of the 20th century – also known as Secession or Jugendstil style. Artists who followed this style wanted to separate themselves from contemporary academic art. The architects, painters, sculptors and handicraftsmen often used floral or geometric patterns, undulating building ornamentation, bright colours and gold in their work. They also preferred soft, round shapes instead of right angles. 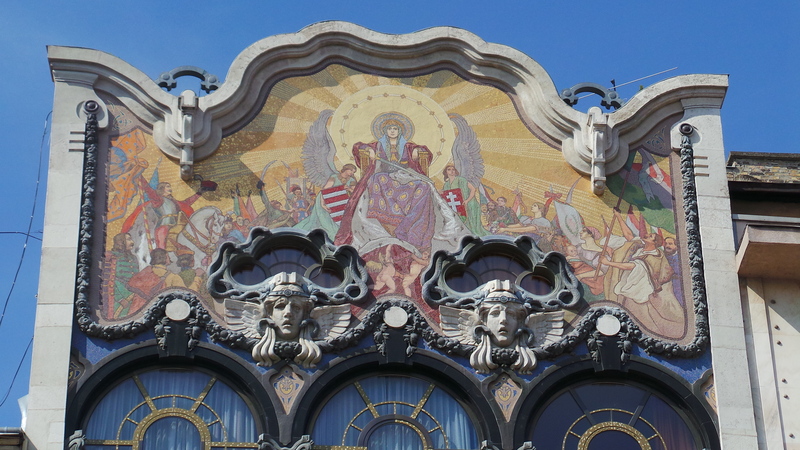 For art and architecture lovers I have collected a list of some of the awesome Art Nouveau buildings in the center of Budapest. This is definitely not a complete list of all the Art Nouveau in in the city but I have included just a few of my absolute favourites. 1. Residential Building – Deák Ferenc utca 17. One of my favourite buildings is opposite the Kempinski Hotel. It is a late Art Nouveau building with huge metal and glass surfaces on the facade; this is specific to the department stores built at the beginning of 20th century, and its cupolas have characteristics of the baroque style. 2. Residential building – Aranykéz utca 2. Undoubtedly one of the most striking elements of the building is the tower with arabesque motifs on the corner of Aranykéz and Régiposta streets. I was lucky enough to get into this residential building and was able to admire the fancy doorway, look up to the painted vault, wall tiles and columns, and look down upon the patterned floor. 3. Thonet House, Residential Building – Váci utca 11/A. 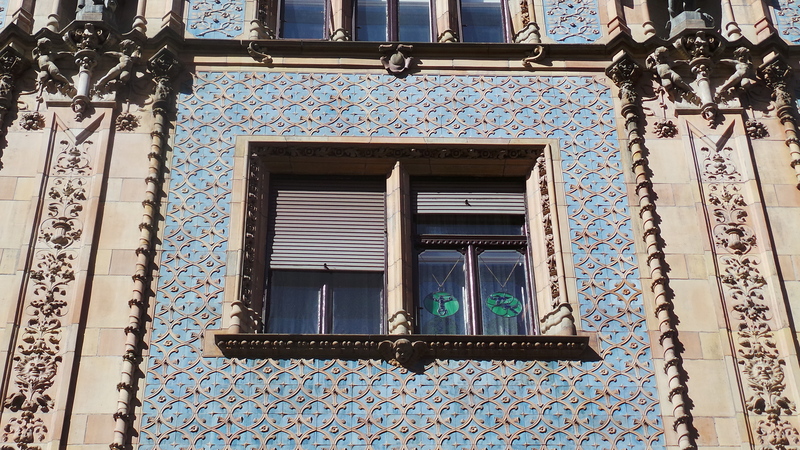 The uniquely designed early Art Nouveau facade (1888-1890) is covered with tiles decorated with pyrogranite (a type of ornamental ceramic). The wrought iron balconies, the original wooden portals and the statues make this building distinctive. 4. Török-bankház: Szervita tér 3. Its prodigious ornament can hardly be seen as it is high up on the top. In the center piece sits Virgin Mary, the patron of Hungary with the Hungarian holly crown on her head and the sword of the first Hungarian king, Saint Stephen, in her hand. On her left and right there are two angels standing and in the background the nobility and the common people are marching. The golden colour dominates in this masterpiece. This is another wonderful masterpiece of Art Nouveau, on the Pest side of the Chain Bridge, facing Castle Hill and the Tunnel on Buda side. I find some parts of the building ethereal. Here you can visit the lobby, the lounge area, the bar and the restaurant. 6. Bedő-ház, The House of Hungarian Art Nouveau – Honvéd u. 3. Although quite small, this collection is a paradise for enthusiasts of this style. 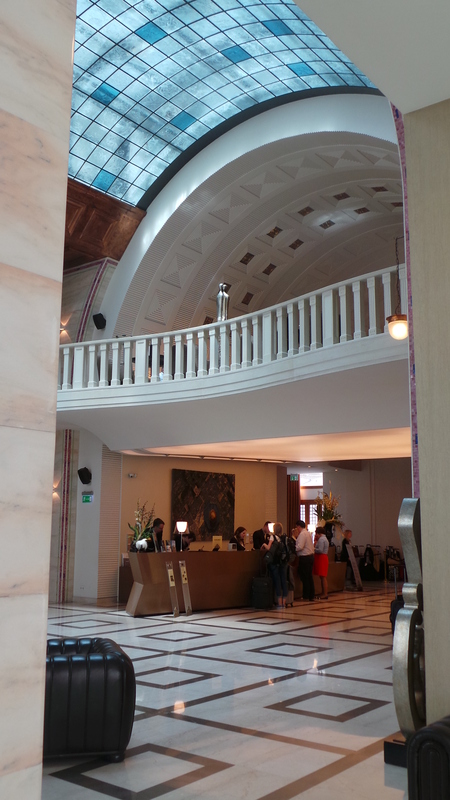 What you should expect: As the building is a collection of furniture, statues, paintings and objects like household items, pottery and clothing of art nouveau style on three floors, it’s rather like a warehouse, not an exhibition. Unfortunately there are no descriptions of items, but if you are a fan of this style you’ll absolutely love it. 7. Postatakarékpénztár Postal Savings Bank – Hold utca 4. 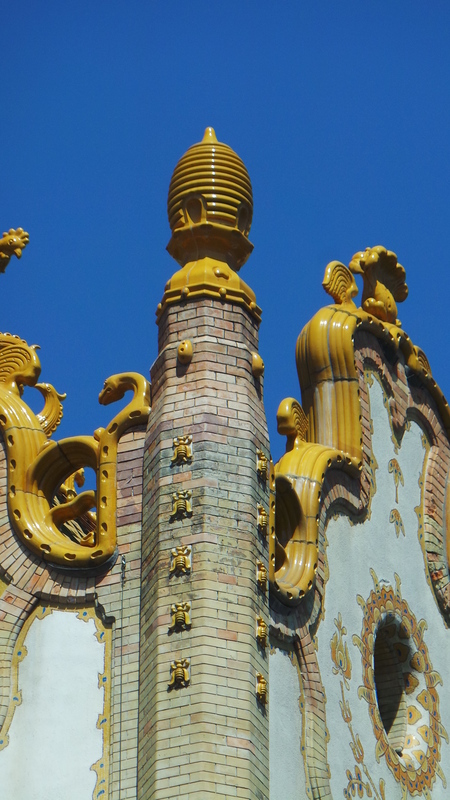 What a splendid building from the beginning of the Art Nouveau period. 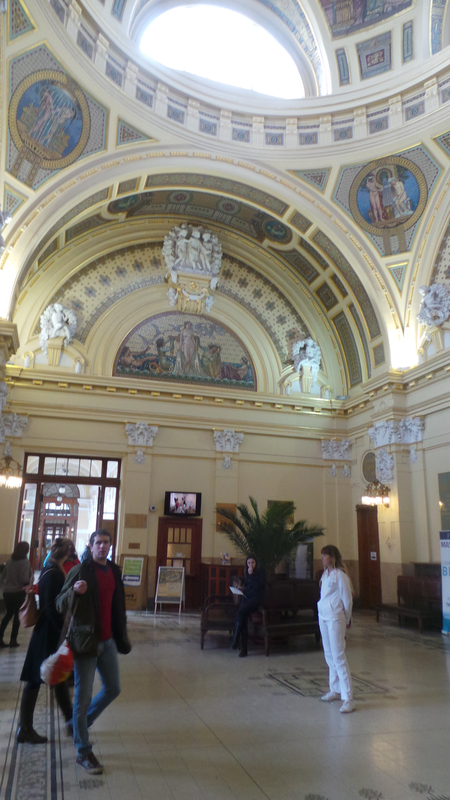 It used to be the headquarters of the Hungarian Royal Savings Bank, now it serves as the Hungarian State Treasury. Look for the bees and the beehives on the frontage, they symbolize frugality. We can discover Hungarian folk art, as well as Asian elements, as seen in the Museum of Applied Arts (Iparművészeti Múzeum). 8. Museum of Applied Arts: Üllői út 33-37. The Museum of Applied Arts is a masterpiece of Hungarian Art Nouveau. It has many specialities like its enormous dome and its interior, evoking oriental splendour. Observe the tiles with Hungarian ornamentation on the exterior and interior walls as well as the colourful tiles on the roof. 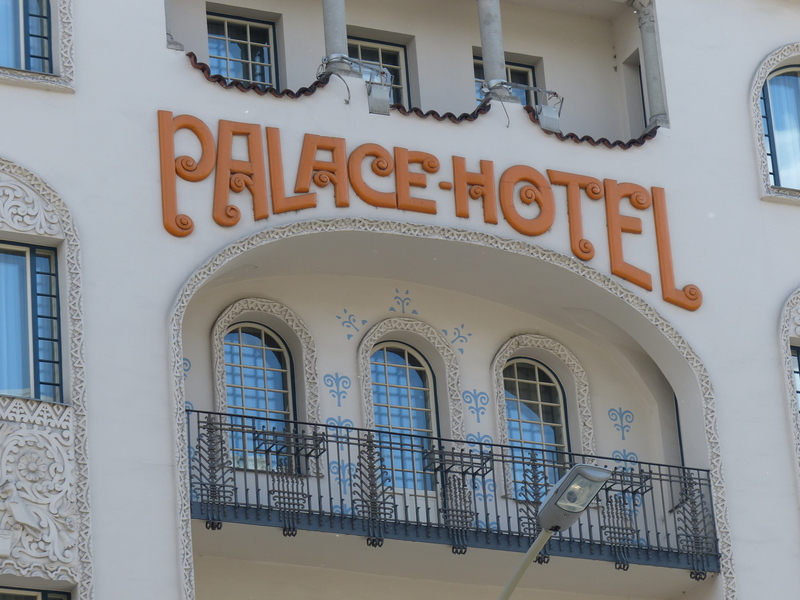 The ceramic ornaments and the very fitting “Palace Hotel” lettering on the facade of this building give a unique appearance. On the top part of the facade a wooden porch can be seen that references Transylvanian architecture. The most beautiful part of the interior is the restaurant on the ground floor and you can partially visit other areas of the building too. 10. 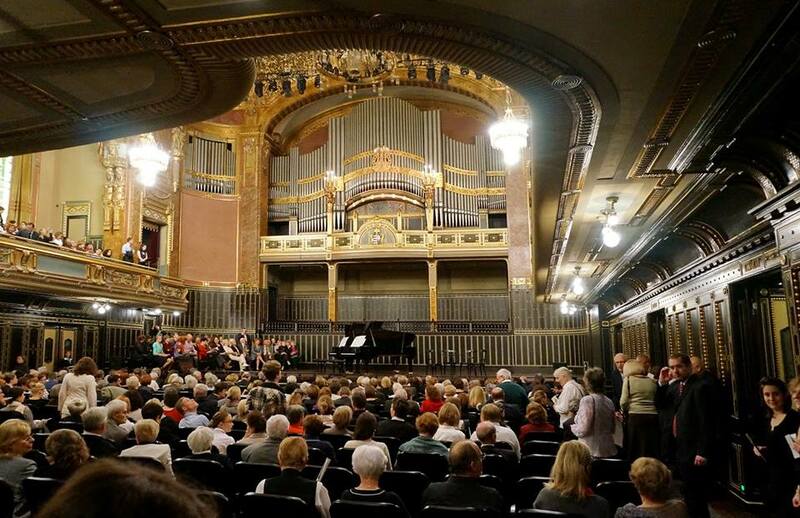 Liszt Ferenc Music Academy – Liszt Ferenc tér 8. The exterior is lavishly decorated with frescos, painted glasses and mosaics. Its concert hall is a wonder. 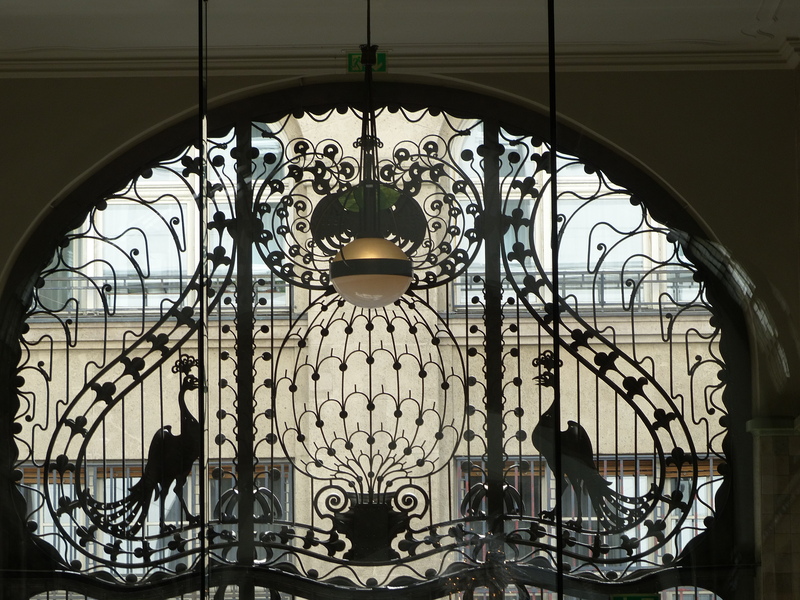 After a few years of renovation this Art Nouveau building from 1907 reopened in 2013. 11. Párizsi Nagyáruház / Divat Csarnok: Andrássy út 39. 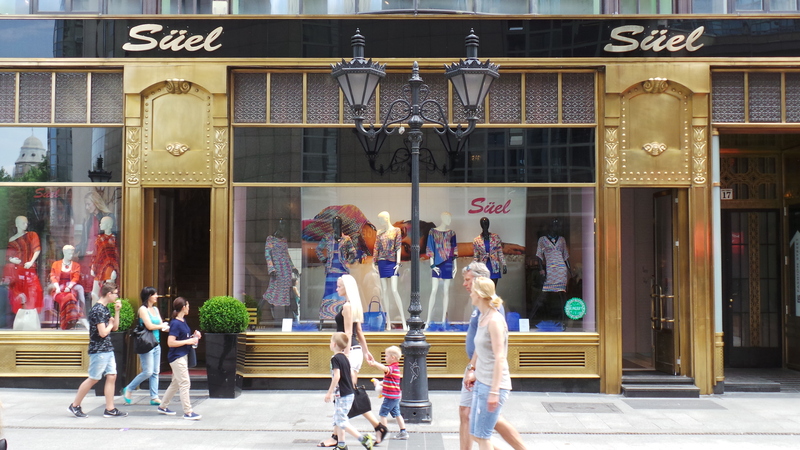 The city’s first significant department store was opened in 1910 in a late Art Nouveau style. Recently the building operates as a bookstore and on the first floor there is a wonderful café that used to be a ball room. Every local and tourist should admire its splendour. In its time it was famous for its astounding sized hall, four floors in height with marble pillars, the gilded staircases and its elevators with glass windows. Visit its roof top bar. The view is fantastic there. 12. 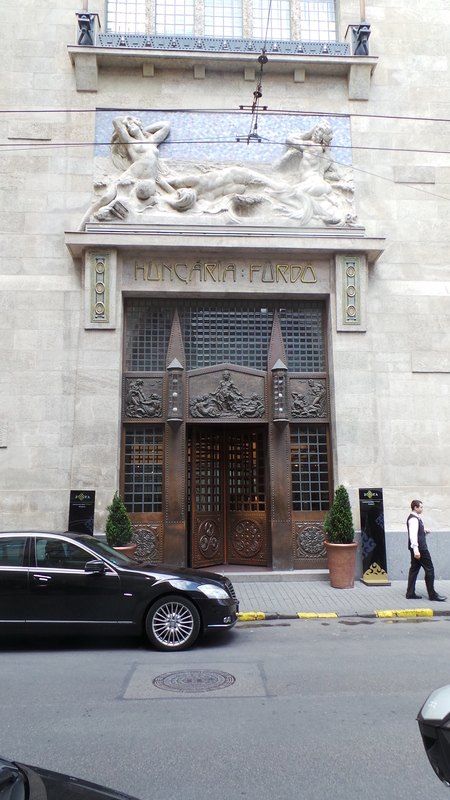 Hungária Fürdő, today Continental Hotel Zara – Dohány utca 42-44. This awesome building was built in 1908 and 1909 as a multifunctional premise: swimming pool, steam bath, club, office and apartment building. The swimming pool was altered to a cinema already in the 20’s. After a few decades the building deteriorated so much that there were plans to tear it down leaving behind only the facade. Fortunately, the interior was saved from destruction and now we can admire some parts of the building as it was altered to a hotel. 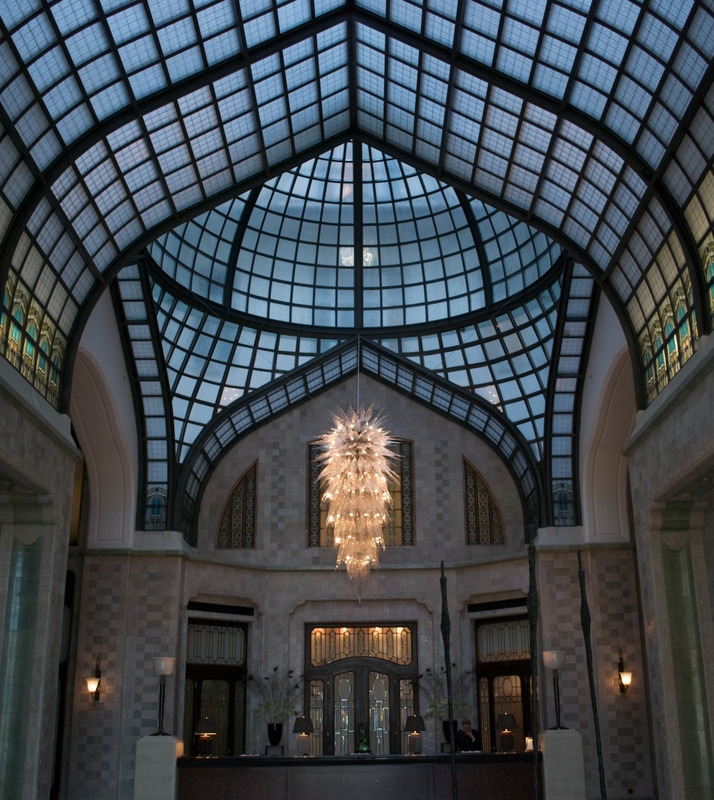 Pop in to see the Art Nouveau lobby with the prodigious turnstile made of copper and the admirable Zsolnay tiles. 13. 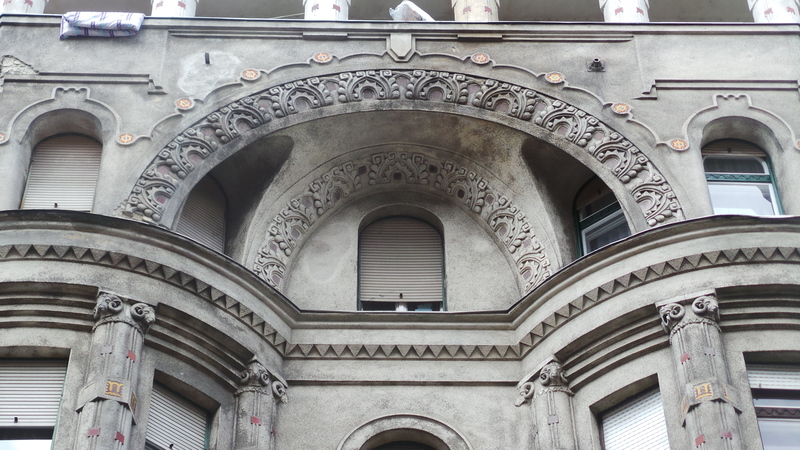 Glücksmann House, Residential Building – Dob utca 8. Built in 1913, this residential building with glazed ceramic tiles (yellow tulip motifs) needs a renovation. It is easy to imagine how beautiful this building once was. 14. 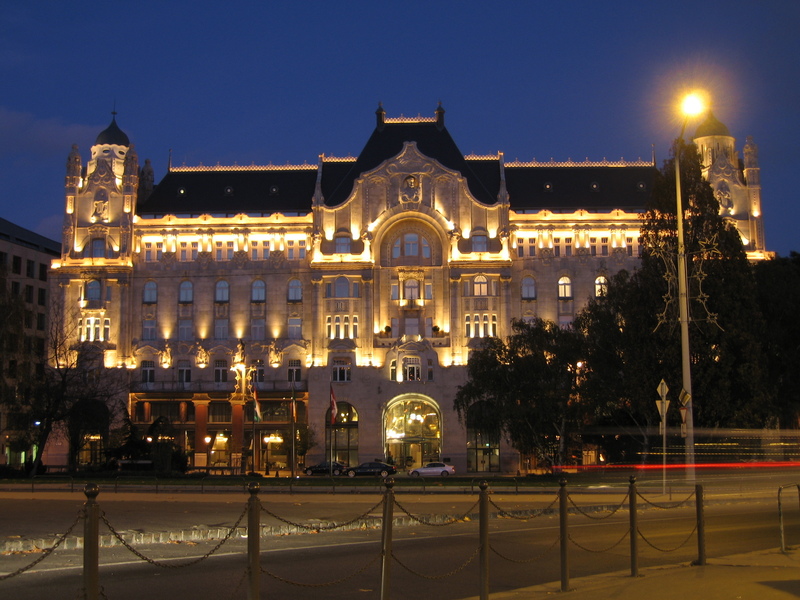 Gellért Hotel and Bath – Szent Gellért tér 1. 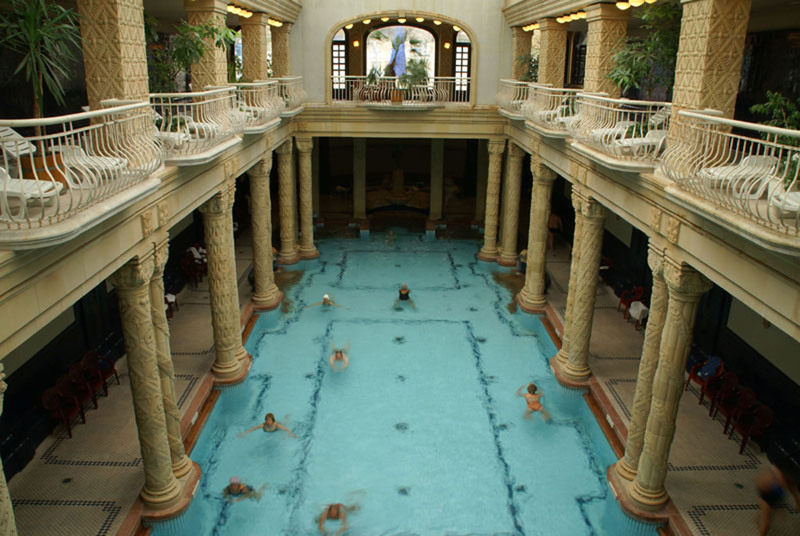 Completed in 1918, Gellért Bath was the capital’s first luxury facility; it was considered the most modern thermal bath of its time. Back then a small hospital with 30 beds belonged to it. 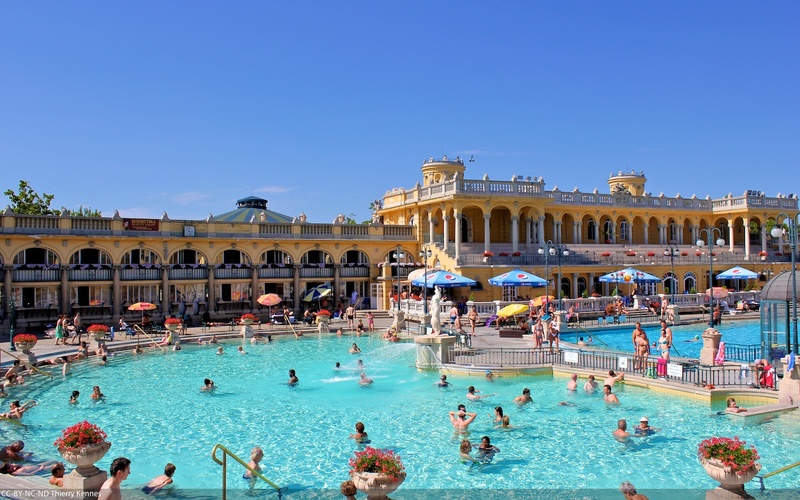 The arched entrance of the bath opens from the Gellért hill side and the statues there symbolize healing. Inside, the two big thermal pool divisions are richly decorated and the walls are covered with colourful tiles. 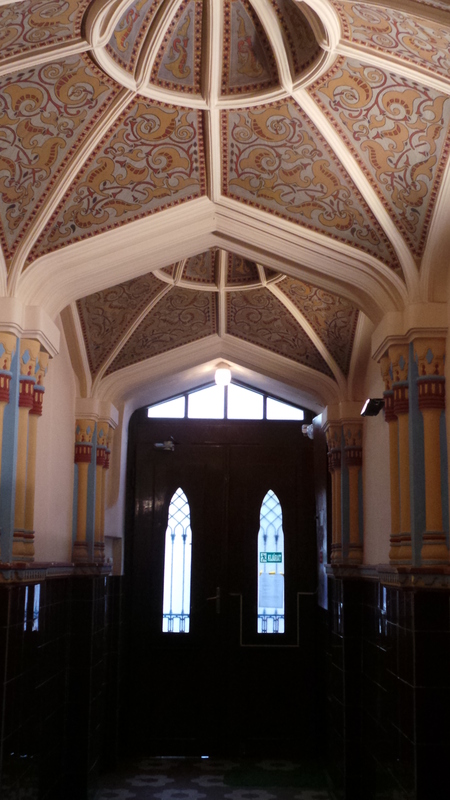 From the lobby, which is paved with colourful mosaics, we get to the central hall. Look up and you will see the gallery and the coloured glass windows and when the sun shines in, the cheerful beams of light will appear. 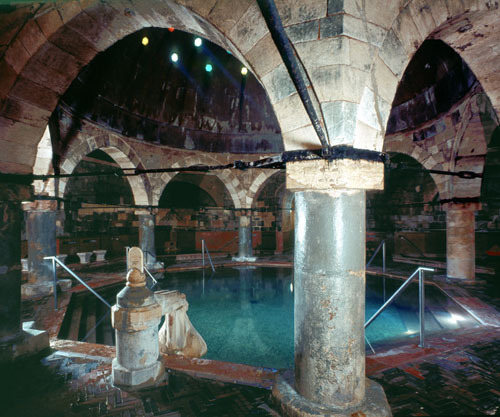 Read more about the bathes.